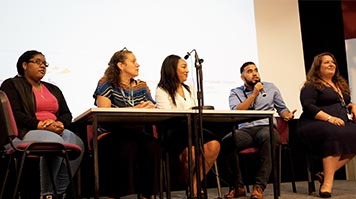 Sixty education and training providers, employers, organisations and support staff were on hand to provide guidance to Lambeth’s young people at the Big Careers Day and Apprenticeships conference on Tuesday 4 July at Lambeth College’s Clapham Common Centre. The Big Careers Day is supported by the partnership of Lambeth Council, Lambeth College and London South Bank University (LSBU), with the aim of helping young people into employment and training, as soon as they leave school or college. The students chose from a range of workshops offering them training in personal presentation and networking skills. Additional support was offered to students from black, Asian and minority ethnic communities (BAME) to help them gain easier access to employment. The purpose of the Big Careers Day is to give students an insight into the wide range of options available to them on finishing their current studies and provide them with opportunities to apply for live vacancies, supplemented by educational and careers advice and guidance. Building on Lambeth’s Apprenticeship Conference in March, the Big Careers Day included the ‘Big Apprenticeships Conference’. Delivered by current apprentices in Lambeth, most of whom were at school in Lambeth just a year or two ago, this short conference gave attendees a chance to find out more about how to apply for apprenticeships, what career opportunities apprenticeships can lead to in the long-term and how apprenticeships work in real life. Parents, guardians, friends and wider family also attended on the day. Councillor Matthew Bennett, Cabinet Member for Planning, Regeneration and Jobs, said: “Lambeth Council is focused on helping young people in Lambeth get the best start in their working lives by supporting our colleges to offer good or outstanding education, with high quality academic and vocational pathways. Professor Pat Bailey, Deputy Vice-Chancellor at LSBU said: “LSBU is delighted to be involved in the Big Careers Day and conference, which aims to present a number of different possible options to Lambeth’s young people, to help them make better-informed choices about their future career path. Find out more about the range of higher and degree apprenticeships available at LSBU.